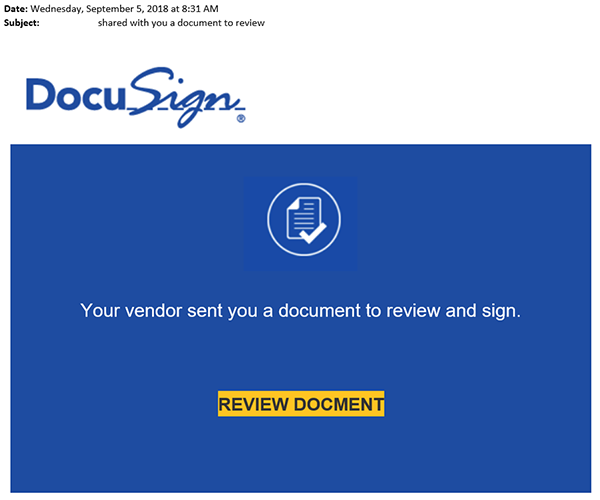 Campus was recently targeted by a phishing attack posing as a DocuSign email. If you received this email please delete it without clicking on any links. If you clicked on the link and provided your credentials your account has been compromised. If you suspect your account was compromised you should immediately go to Account Center in the CSU, Chico Portal and reset your password. Do you have any info that such a source is a phishing site? I have not opened the link in the message that is purported to send me to the drive site. Seeing your above docusign announcement raised my suspicions. Sounds suspicious. If you aren’t expecting a file then it is probably a phishing email.